This heater core fits 63 to 67 Chevy II and Nova. It is 100% new and comes with a 1 Year Guarantee We ask that you match up your heater core to this picture before placing your order as some catalogs are not 100% accurate. This heater core fits 64 to 67 GM A Bodies without factory A/C. It is 100% new and comes with a 1 Year Guarantee We ask that you match up your heater core to this picture before placing your order as some catalogs are not 100% accurate. This heater core fits 63 Bel Air, Biscayne With A/C 64 Impala/Chevelle/Bel Air/Biscayne With A/C 65-67 Chevelle With A/C.It is 100% new and comes with a 1 Year Guarantee We ask that you match up your heater core to this picture before placing your order. This heater core fits 63 to 67 Corvette without factory A/C. 2 1/2" thick It is 100% new and comes with a 1 Year Guarantee We ask that you match up your heater core to this picture before placing your order as some catalogs are not 100% accurate. 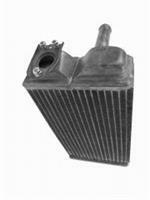 This heater core fits various 65 to 68 GM models with factory A/C. It is 100% new and comes with a 1 Year Guarantee We ask that you match up your heater core to this picture before placing your order as some catalogs are not 100% accurate.